Upsets brewing at the Dictys! New video lifts the podium hopes of three teams: #11 (Faix – Germany), #12 (van Haastert / Kortholt – Netherlands), #17 (Kimmel – US). Watch the video closely for clues to contenders in the Fastest Cell question! But don’t forget that three teams have yet to be broadcast including some pre-race favorites. These are #1 (Queller – US), #18 (Kay – UK), # 14 (Müller-Taubenberger – Germany). Then come to SciCast Race Central to adjust your bets! 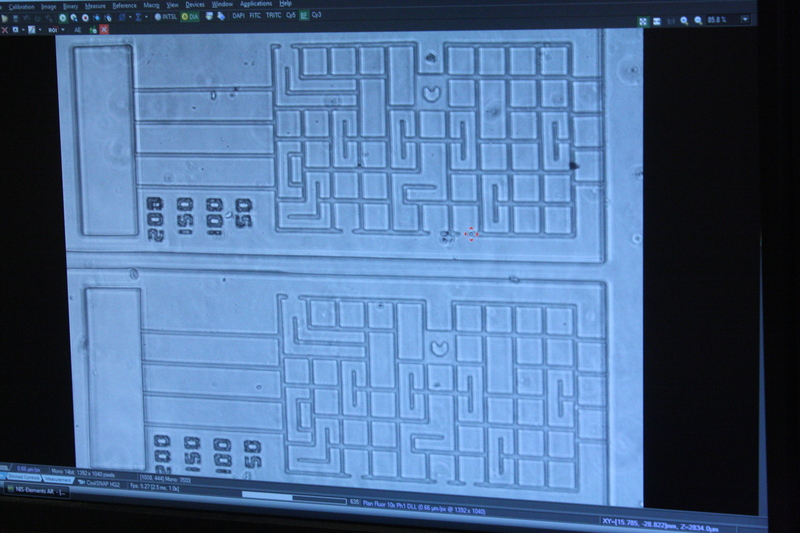 The 2014 Dicty Race Course (shown below with no cells in it) was collaboratively designed by a team at Daniel Irimia’s lab. Some clever lad even thought it would be funny to put a Pacman in there. Good call! At the end of the race course is a straightaway that is 200 microns in length. This straightaway is used to measure speed. 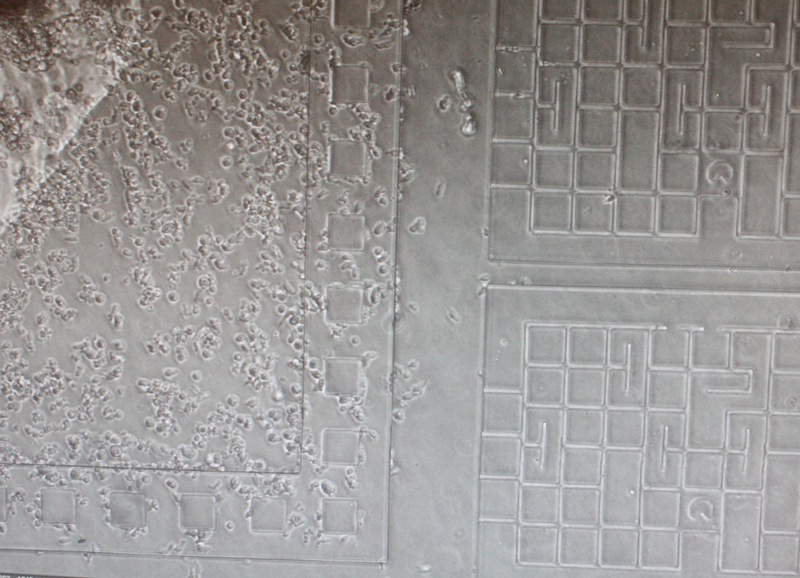 Since the microscope only takes an image every 5 minutes, the straightaway allows for Daniel’s lab to tell exactly how many microns the cell moved during the 5 min between that photo and the previous one. Speed is not measured while a cell is in the course because the cell might have taken a number of turns since the last image was taken. To start the race, the cells are dropped into the middle of the maze (circle in upper left) and they begin to migrate outward into the maze on the right. Can you tell what the shortest path is?! Tweet @scicasters and let us know what you think!